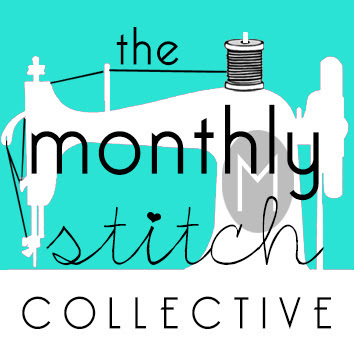 This month, for the Make A Garment a Month challenge, I decided to make a new knit tunic. I chose a pattern that I discovered on Craftsy, by a company called Modkid -- I didn't know about this company before because it is almost entirely cute kids' patterns, which I don't need and generally don't pay any attention to! 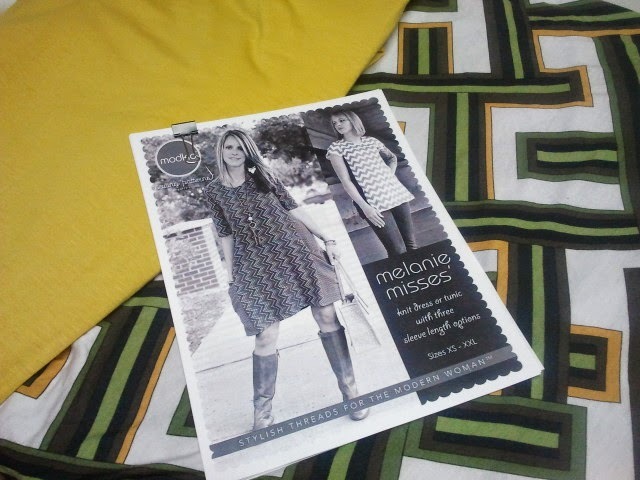 But there was an appealing adult pattern, called the Melanie Misses Top and Dress. How could I possibly resist a pattern with my name on it, literally? I didn't. I bought it and downloaded it, knowing exactly the piece of knit in the stash that I'd love to use for it. It all went together like a dream once I got started, finally. The fabric I wanted to use was perfect, and I had just enough -- it was a knit panel print, and I just squeezed on the main body of the pattern -- so close that the inside of the hem hides the edges of the print where I was a tiny bit over the line ;) Finally a use for that odd panel! The sides are in my current favourite colour, mustardy yellow, and a very soft knit. 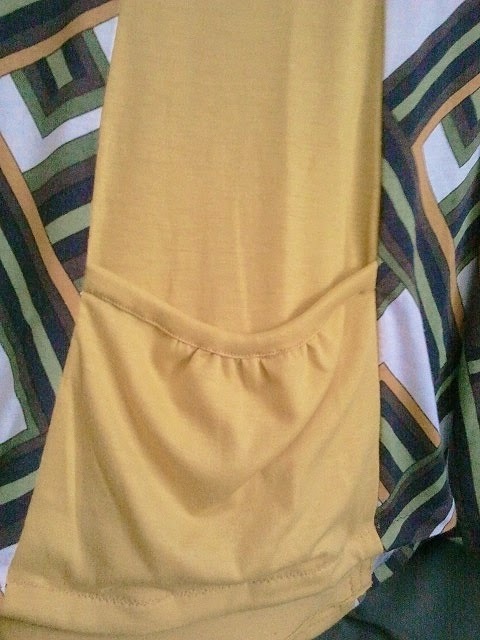 The gathered pocket on the side panels really sold this one to me -- I love pockets, and was willing to give this one a try despite the fact that those slouchy pockets would sit right on my widest parts. I think it turned out fine, though, it doesn't draw any undue attention to the area, and they are really cute. The pdf is really well made; you can just tape together the pages for the pieces you need, which aren't numerous anyway. The instructions are clear, with lots of diagrams for visual assistance, too. I had to take out a few inches for length, or even the tunic would have been a dress...but I am only 5'2-ish so that is nothing new. Just FYI if you are also short! The hem swings out but not too much -- allowing it to skim the lower half but not swamp it. The construction is pretty straightforward, too; the only element I might change if I make it again is to bind the neck rather than turning it under and stitching down as per the instructions. On this make it worked well, and unless I made a contrast binding from the yellow I didn't have a choice as I had no more of the main fabric left at all. I like the plain edge on the neck with this print, and it makes for a quick finish at the end. The only minor change I made was to do a double row of hem stitching on the pocket panels, since the two layers are folded up together and I wanted to be sure they would be sturdy enough to hold when I tossed things into them. Linda used my phrase!! 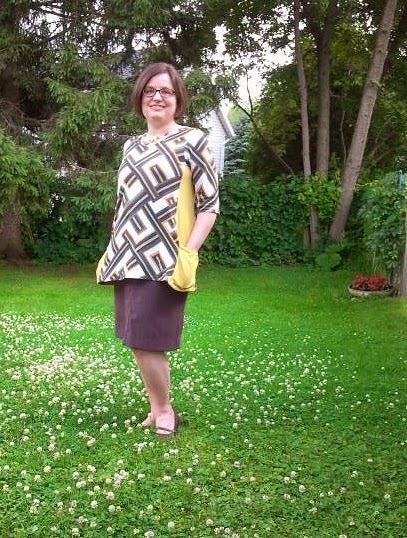 It is cute, very cute - I looked at the pattern and I think the tunic is the way to go. 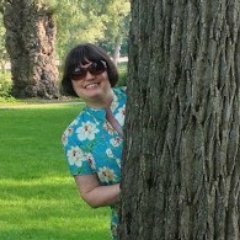 You have been busy over here - I have missed some of your posts. Yes, I have been keeping busy ;) I thought the dress was just too much for my shape, but I do love the tunic length. Glad you think so! There are lots of neat versions shown in the pattern. That's nice to hear! I do love the rather crazy print. love, love, love your top. Great fabric and I love the pockets on it. thank you! I've worn this quite a bit already, and I really love it.